SpaceX plans to launch a robotic space capsule, fly it around the world two times, then order the craft back home Wednesday in a whirlwind test flight to demonstrate the ship's readiness to NASA. The mission is scheduled to last three-and-a-half hours after originating from Cape Canaveral, Fla. Splashdown of the Dragon spacecraft will occur in the Pacific Ocean several hundred miles off the west coast of northern Mexico and California. Liftoff from Cape Canaveral's Complex 40 is scheduled for a launch window opening at 9 a.m. EST and closing at 12:22 p.m. EST (1400-1722 GMT) Wednesday. Launch was delayed 24 hours as SpaceX engineers inspected and repaired cracks in the Falcon 9 second stage's Merlin engine nozzle. The nozzle features a 9-foot-long extension made of ultra-thin niobium alloy. Officials discovered cracks in the material in a review of close-out photos Monday, and SpaceX repaired the problem. The flight is sponsored by NASA's Commercial Orbital Transportation Services, or COTS, program, an initiative to develop private spacecraft to ferry cargo to and from the International Space Station. The federal government has invested $253 million in SpaceX's Falcon and Dragon programs so far. The awards are based on milestones in design, development and flight testing of the company's Falcon 9 rocket and Dragon capsule. Described as a public-private partnership, SpaceX is utilizing NASA know-how and resources for the flight, but the company holds ultimate responsbility for the mission. "We've spent well over $600 million at SpaceX getting to this point," said Gwynne Shotwell, SpaceX president. "NASA took on the role as the lead investor (and) also a technical consultant to SpaceX to offer assistance when needed and requested," said Alan Lindenmoyer, manager of the commercial crew and cargo program at NASA's Johnson Space Center in Houston. Elon Musk, SpaceX's founder and CEO, said the flight is supposed to last two orbits, but managers could issue a re-entry "at any time" from the company's new Mission Control Center in Hawthorne, Calif. The two-stage Falcon 9 rocket will deliver the 11,500-pound Dragon spacecraft to orbit 10 minutes after liftoff. Then the capsule will pull away from the Falcon's second stage, leaving behind its trunk compartment that will ultimately house unpressurized cargo and experiments on future flights. The mission will operate entirely on battery power, Musk said. The next flight will feature twin panels of solar arrays for electricity. "Then it's going to basically turn on all its systems and engines and start flying around the sky," Musk said in an interview Sunday. "Then something could go wrong in the propulsion system, electronics, software, pressure vessel integrity, we could lose telemetry. I'm taking this pessimistic view and naming everything that could go wrong. It's important to let the public know there's so much that can go wrong. This really is rocket science." 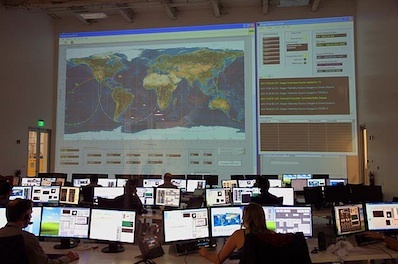 The Dragon will communicate through a fleet of NASA tracking satellites and a network of ground stations scattered across the globe, ensuring mission controllers in Hawthorne are in regular contact with the spacecraft. Eighteen Draco thrusters on the craft's exterior will provide impulses to change its orientation in space and alter its orbit. Several of the miniature rocket engines will fire at the end of the flight to slow the ship's velocity and drop from orbit. Engineers have programmed portions of the Dragon's rendezvous sequence with the space station into the craft's computer for this mission. The flight testing will verify the capsule's ability to accomplish tightly-choreographed maneuvers. "The intent is the Dragon will execute a regimented series of maneuvers, and once its done that, we will command it to return to Earth," Musk said. The maneuvers will test "the elements that matter to determine whether our guidance and navigation hardware is doing what it should and that our inertial navigation system is correctly reporting where it is in the sky," Musk said. Controllers will have the ability to intervene if necessary, but most of the tests are automated. Mission control will issue the command for the Dragon's de-orbit burn and re-entry, according to Musk. The plunge back into the atmosphere will be expertly guided by the craft's Draco thrusters. The capsule's blunt shape, designed to help steer the vehicle in the atmosphere, can also be exploited for precision landings, Musk said. "A lot of people look at a capsule and think that it doesn't have a controlled re-entry," Musk said. "A capsule is a very precise, controlled re-entry. It uses its thrusters on re-entry to adjust its course. As we fly more, we believe we can land the spacecraft within an accuracy of a mile." Shielded by a robust ablator known as PICA-X, the Dragon will brave temperatures of more than 3,000 degrees Fahrenheit during the phase of peak heating. Engineers installed panels of the Phenolic Impregnated Carbon Ablator, or PICA, material on the backshell of the Dragon spacecraft. Musk says PICA-X is designed to withstand the heat from terrorizing velocities during re-entry from missions to the moon or Mars. "For an Earth orbit re-entry, our heat shield should barely be scratched, unless we did something wrong, and that's always a possibility," Musk said. 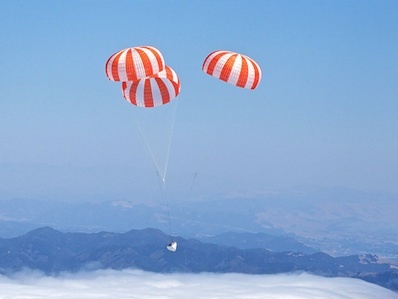 Two drogue parachutes will deploy to stabilize the spacecraft at an altitude of 45,000 feet, then three 116-foot-diameter main chutes will unfurl to slow the capsule's descent to a gentle 12 mph before splashing down in the Pacific Ocean. Recovery boats are stationed in the Pacific to retrieve the capsule and return it to SpaceX headquarters in Hawthorne. 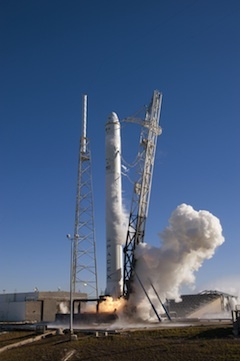 The mission is flight testing all of the Dragon's guts, including computers, software, plumbing and electrical systems, for the first time. "Dragon is a very complicated spacecraft," Shotwell said. "It's a spacecraft that's designed to withstand the incredible heating and pressure loads during re-entry. We've got 18 monomethyl hydrazine and (nitrogen tetroxide) thrusters, which are dual redunant. We've got dual redundant drogue parachutes, redundant mains, a guidance navigation and control system that is designed to keep us in a tight berthing box while the International Space Station arm picks us up." NASA selected SpaceX and Orbital Sciences Corp., both COTS participants, to supply the space station with cargo delivery, disposal and return services in 2008. SpaceX's contract is worth $1.6 billion for 12 flights, but its value could be as high as $3.1 billion is all options are exercised. Shotwell said SpaceX's first operational cargo flight to the outpost is slated for November 2011. At least one, and possibly two, test missions are on tap before then to prove the Dragon's ability to rendezvous and berth with the space station. NASA's original agreement with SpaceX called for three test flights, including Wednesday's mission. But Musk said his company hopes to cut one mission from the manifest. The next flight in the sequence was supposed to approach the station to demonstrate rendezvous and navigation techniques, then back away and return to Earth without berthing with the complex. "Irrespective of what happens to this flight, I think the best thing for schedule is for the next mission to go directly to station," Musk said. "You don't want to get all the way there, meet the requirements, then leave." 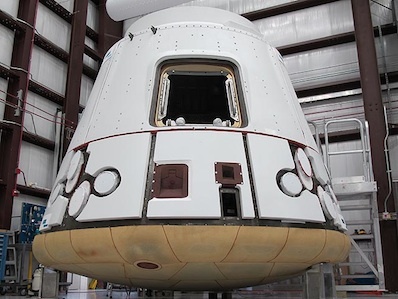 More testing could be done on the ground and the Dragon could be put through a more strenuous series of on-orbit demonstrations before being permitted to approach within 30 feet of the station, where the outpost's robotic arm will grapple the ship. NASA officials are withholding approval of the change until they can assess the outcome of Wednesday's mission. According to Shotwell, SpaceX could load some cargo into the Dragon test flight to the station, providing an early bonus delivery as NASA's heavy-lifting space shuttles are retired. Orbital's Cygnus logistics freighter won't be ready for operational flights until early 2012. "With the decision to extend the life of International Space Station to 2020 and beyond, and the imminent retirement of the space shuttle, cargo delivery services to the ISS will become more important than ever," said Phil McAlister, acting director of NASA's commercial spaceflight development office. "We are definitely looking forward to the day when we will have multiple redundant capabilities for ISS cargo transportation services." The Dragon is a leading candidate for future services as a crew transfer vehicle for the space station. Although SpaceX hasn't received a contract from NASA to carry astronauts to the space station, the company says it can outfit the Dragon capsule for human occupants within about three years from receiving the authority to proceed.